As I was having my daily conversation with my mom today, she was describing this great dish with polenta that she made last night for dinner. Polenta stuck with me as I do not remember the last time I had some, let alone prepared some. Why not prepare it with vegetables and steak.In the kitchen I went, refrigerator door open, and vegetables started coming out of the crisper.Tonight recipe is my own creation and I have to say, I had fun putting it together. The best compliment I mom can ever get is a clean plate, and that is exactly what I got from my boy.TIP: Be very careful with the polenta as it has tendency to splatter. The tomatoes sauce needs to be nice and moist. If it seams too dry add some red wine, if wish, or water.Red wine is a most with this dish.Bon Appetit! 1. In a very large skillet over medium heat add the oil. Once the oil is hot add the onion and cook until translucent. Add the bell peppers, zucchini, carrot, thyme, parsley and season with salt and pepper. 2. Cook for 5 minutes and add the fresh tomatoes. 3. Cook for another 3 minutes. Remove the vegetables from the skillet and place in a bowl. Do not clean the skillet. 4. Place the skillet over the heat over high and add the flat iron steak cubes. Sauté for 3 to 5 minutes. When all sides are golden brown, remove from the skillet and place in the same bowl of the vegetables. 5. Add the San Marzano tomatoes to the skillet and cook at medium heat for 5 minutes. 6. Return the vegetables and meat to the skillet with the tomatoes sauce. Season with salt and pepper. 7. Cook for 20 minutes making sure that the sauce will not dry out. 8. Prepare the Polenta according to the box directions. When done add the butter and mix well. 9. 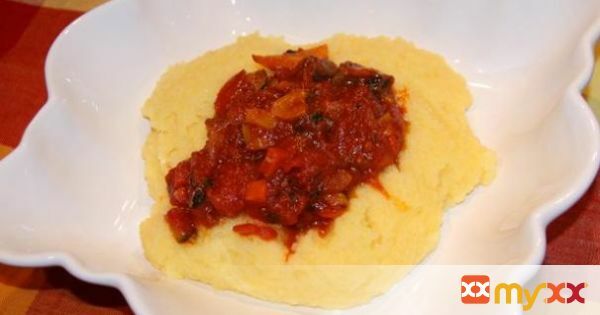 Place a nice mound of polenta in a bowl and cover with the tomatoes-vegetables sauce.